Smoking, drugs, alcohol or any other habitual activities can turn into addictions that negatively affect our lives and those of our loved ones. Often addicts do not recognize these signs or are in denial and need help to overcome these habits. 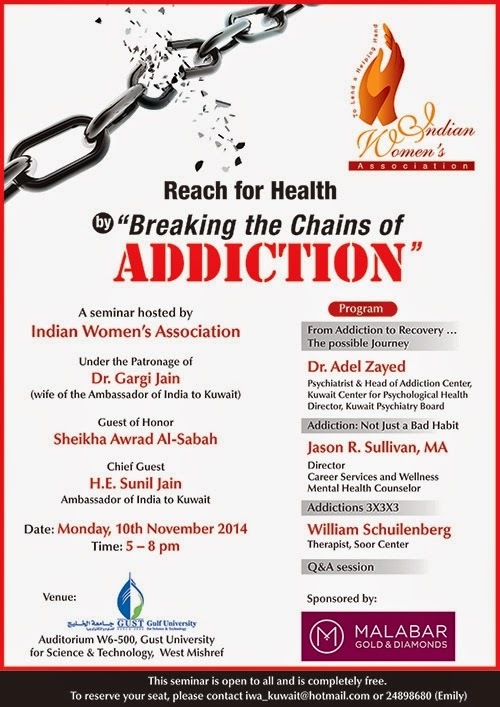 Recognizing a need for “Breaking the Chains of Addiction”, the Indian Women’s Association is organizing a seminar that addresses these issues under the Reach for Health initiative. Join us on Monday, 10th November, 2014 from 5 – 8 pm at the Gulf University for Science and Technology (Auditorium W6-500) where leading experts will speak about the causes, prevention and cures for common addictions. The seminar is open to all and completely free of charge. To book your seat, email iwa_kuwait@hotmail.com or call 24898680.